One of the high points of my CAE bookgroup meetings (a.k.a. The Ladies Who Say Ooooh) is when the book for the upcoming month is fished up out of the plastic box and brandished with a flourish. I’ve found recently that one advantage of actually doing some work on my thesis is that I am no longer likely to look at the next month’s offering and think “Damn, I’ve already read it!”. 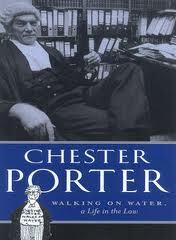 When our book for our final meeting was revealed last month, I found myself thinking “Good grief, who on earth chose this?” because it was Chester Porter’s memoir Walking on Water: A Life in the Law. At first I thought that I’d never heard of the man, but I soon realized that I had without realizing it. Most famously, he worked as Counsel assisting the Royal Commission into the convictions of Lindy and Michael Chamberlain case, and he successfully defended Det. Sergeant Roger Rogerson on a bribery charge. He was known as “the smiling funnel web” and the title of the book comes from a quip directed towards him that “Chester Porter Walks on Water”. Even though I encountered this book as part of my “off-duty” reading, I was very happy to read it in relation to Judge Willis. The little gremlin of self-doubt that lives in my head regularly derides my ability to write about a man of the law (albeit a 19th century colonial man of the law) when I have no experience of that milieu at all. The 19th century judicial culture is something that I am deducing for myself, largely from negative evidence of Willis’ breaches of judicial etiquette, rather than from any deliberate exposition of it by an insider. So what did this book, written by a late twentieth century Australian barrister show me? First, that even though a man might be a highly educated, brilliant barrister, he is not necessarily a successful memoirist. Although Porter clearly expresses a number of opinions about the law, they are hedged with qualifications and nimble logical footwork. The book reads like a series of mini-essays which, from a reader’s perspective, made it easy to abandon a chapter or two if one’s attention was wandering. There was no discernible overarching structure or motif to tie the book together. In several places it was quite repetitious and the prose was doggedly careful. His daughter is the late poet Dorothy Porter, but whatever else she gained from her father- and I am sure that there is much- there is little poetry here. Second, the book shares with military memoirs that felt need on the writer’s part to doff one’s hat (wig?) to learned colleagues, by praising them, rather formulaically, in passing. Hence, many of his associates are named with the bracketed annotation (now SC; now QC, now Supreme Court Judge). Given this emphasis on naming his colleagues, it seemed strange that there was no index. I found myself wondering about the audience for the book. The frequent greetings-in-print that he gives to his colleagues suggests that he sees them as one readership, but the careful explanations and observations about the law are aimed at a more general lay readership. The author comes over as a somewhat stilted, and rather old-fashionably decent man, able to look back at his life and acknowledge mistakes, and reticent about his family and private life. Nonetheless, a book can work on one level while being perhaps less successful on another. Despite my qualms about the structuring and language of the book, I found myself listening carefully to the radio report of evidence given recently by Ian Macdonald at the recent Independent Commission Against Corruption hearing. It was another cross-examiner at work because Chester Porter retired eleven years ago, but as I listened I found myself thinking about the construction of a chain of questions and responses as an intellectual and rhetorical exercise. And as I read about the successful appeal of Jeffrey Gilham a few days ago, Porter’s warnings about expert testimony, the demeanor of witnesses and the shortcomings of police evidence loomed large in my mind.